Apple Spartan is an unusual deep red/purple skinned apple with white flesh. The fruit is juicy and crisp and eats like a green apple with a satisfying crunch. The flavour is sweet and a note of honeyed wine is often apparent. As well as being a tasty eating apple, Spartan makes a good juice. Adorned with pretty pale pink to white spring flowers followed by burgundy fruits, Spartan is a particularly attractive apple tree. 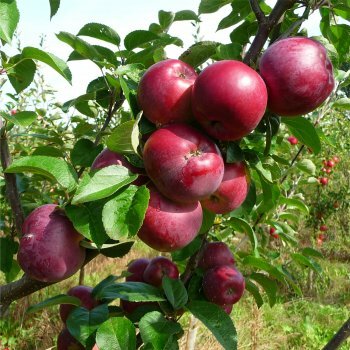 From Canada in 1926, Apple Spartan is a tough tree for Northern and less favourable areas. It will produce heavy, reliable crops of medium sized apples in early October. Pollination is required by another apple in group A, B or C situated within a half mile radius. Spartan is a group B apple tree and requires a suitable pollinator within a 1/2 mile radius. Apple trees should be spaced according to their rootstock, for example an MM106 (semi-vigorous) rootstock will require approx. 4.5 metres between trees, whereas an M27 (very dwarf) rootstock will require approx. 1.5 metres between trees.